An Indianapolis woman says she found bugs in her Wendy’s baked potato. 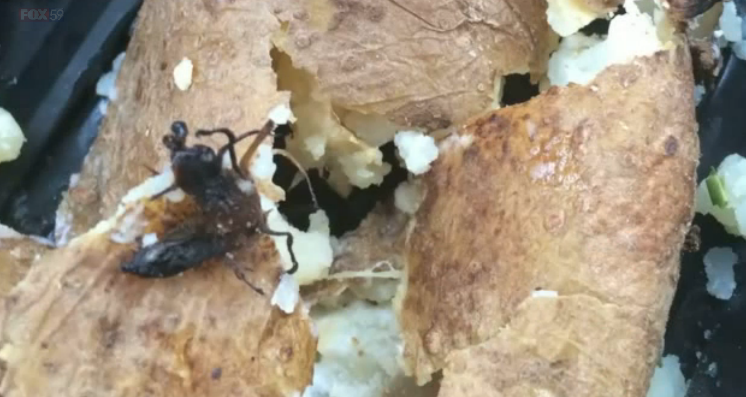 A Wendy’s customer in Indianapolis tells Fox59 that she stopped by the restaurant last week to pick up her usual baked potato, but while she was chowing down on the spud, she noticed what she believes are bugs underneath the potato. The restaurant, where the woman had been eating several times a week for about six months, gave her a refund. A manager at the Wendy’s says that what the woman called bugs were really cooked sprouts from the spud. However, the woman disagrees and called the county health department. Fox 59 reports that an inspection on Friday found no bug-related violations at the location.